A 120 cm tall palisade structure of bamboo poles, with the intervening spaces woven into a wickerwork of bamboo, and an inset made out of a plastic film, form the tank. 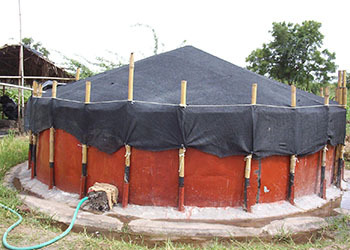 It is filled with potable water during the rainy season, after which it is covered by an opaque black plastic film. If the bamboo parts used in constructing the tank are chemically impregnated they resist biodegradation and last for even 10 years under outdoor conditions.